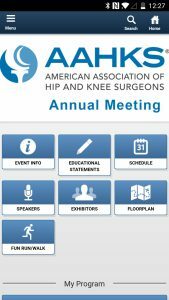 AAHKS has launched a new app for the 2018 AAHKS Annual Meeting. The app puts the schedule, speaker information, abstracts, exhibitors, floor plan and the Fun Run/Walk at your fingertips. You can download the app now in the Google Play and Apple stores. Search “AAHKS,” or tap here on your mobile device to link directly to the download. Please uninstall any older app versions that might be on your device.